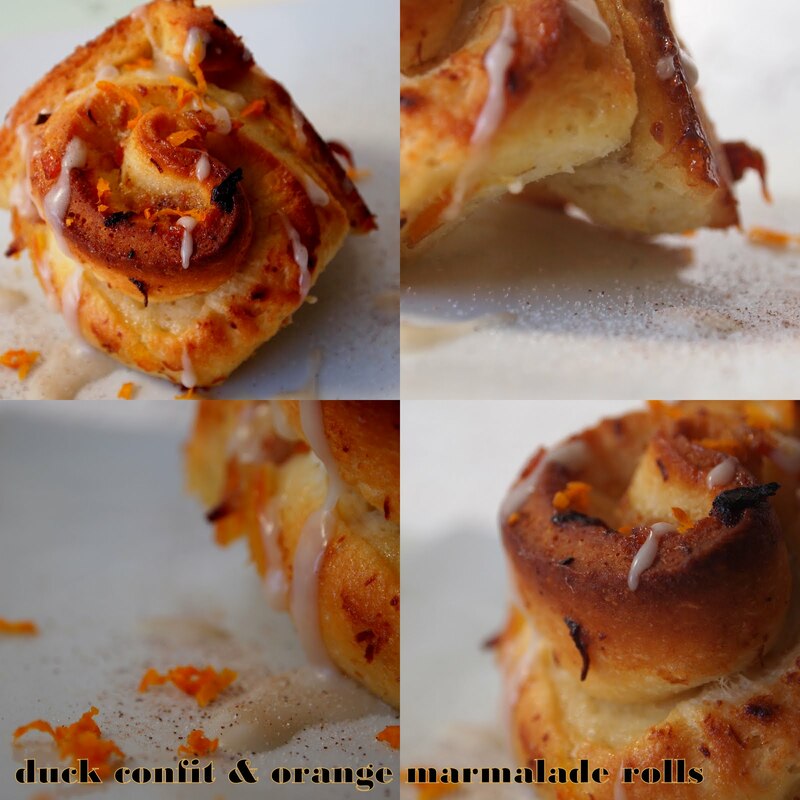 But since these were Cinnabon's gon rags to riches, we of course added our own little twist... a heavy helping of Duck Confit & Orange Marmalade! Because, why not? One of my hero duo's in the culinary world are the extremely talented Aki & Alex of Ideas in Food, a collection of inspired ideas, photos & videos of their adventures & experiments. I look to them for little clues as to how to make everything I make even better & when I saw them post photos of their insanely delicious breakfast, I knew I had to try it myself. And boy did these turn out well... So well in fact, that I feel compelled to share my take on their idea here! First, mix up a batch of simple brioche. The trick here is to prep it 2-3 days ahead of time so it has loads of time to rise in the fridge. In a large bowl, whisk together the eggs, water, honey, melted butter, yeast & salt. Once your starter is nice & mixed, slowly add in the flour. Get your hands in there & work it in, making sure not to leave any tiny dry bits. It's pretty overwhelming mixing in 7 cups of flour, but the end is totally worth it! Cover it up and stick it in the refrigerator at the very least overnight, but give it a few days to really set up. When you're ready to make the rolls... first thing's first. Take the dough out of the fridge, divide it into thirds. Take the first batch, flour your board & rolling pin & shape the dough into a large ball with no air pockets. Let the dough rest for 10-15 minutes. Roll out the dough into the largest square (or oval if you can't quite get the square right) as possible. You'll know your dough is ready if it doesn't keep springing back into a smaller state. Make sure that you keep your board well floured so the dough won't stick. Once it's rolled out, evenly spread your duck confit on top. Then spoon out 1/3 of your Orange Marmalade making sure to cover the entire area. Brush with melted butter & sprinkle with sugar. Preheat your oven to 350F & then bake for 30-40 minutes, or until the tops are nice & browned. While your rolls are baking, mix up a simple glaze with the powdered sugar & water. Zest the oranges & set aside. When your rolls come out nice & hot, drizzle on some "icing" dust with orange zest & a sprinkle with a little cinnamon! Enjoy!